Listening to King Gizzard and the Lizard Wizard’s ninth album, Flying Microtonal Banana, one is inspired to recall Karl Marx’s fairly damning summation of history’s propensity for repeating itself – “the first time as tragedy and the second time as farce. In this case, there’s no denying that the fairly delightful rock n’ roll King Gizzard is peddling is the farcical incarnation of the psychedelic rock which first materialized in San Francisco in the 1960s; filled with unusual sound effects but combined with rock and blues, it created a musical form which has since gone on to inspire regular revisitation over the last fifty years. Whether or not that’s tragic is open to debate, but I hold the ongoing redevelopment of psychedelic rock responsible for the fact that the Grateful Dead were able to continue performing to large crowdsever after the passing of Jerry Garcia. That said, it does need to be conceded that the “farce” component did not begin with King Gizzard (if anything, it could be argued that that it was started by the Grateful Dead, at some point in the Eighties or Nineties) but, listening to Flying Microtonal Banana, there’s no question that the group has honed the sound (and the farce, by extension) to a rapier’s edge and made it sound pretty damned good. Even with the above praise made though, it’s still important to point out that listeners need to take Flying Microtonal Banana on its own terms if they want to get anything out of the album, and that fact is self-evident from the moment “Rattlesnake” speeds out to open the album. There, King Gizzard and the Lizard Wizard go out of their way (as Black Lips did, several years ago) to lean hard on the psychedelic sonic references and make sure that everyone who’s listening knows exactly where the band’s coming from and what their intentions are. Right away, listeners will be able to mark the dusty sonic accoutrements, the stringy guitar performance and the repetitive, poppy and stoned vocal performance upon which the song rides and really get a sense of what they’re hearing; the band makes it undeniable that what they’re making is third or fourth generation psychedelic rock and, because it is that far removed, it is lighter and easier to digest and the band plays to that rather than trying to fight against it (which would have likely turned out much worse). Because of that, after “Rattlesnake” has rolled out, listeners will find a warm sensation in the pits of their stomachs and know then that they can palette more from Flying Microtonal Banana. 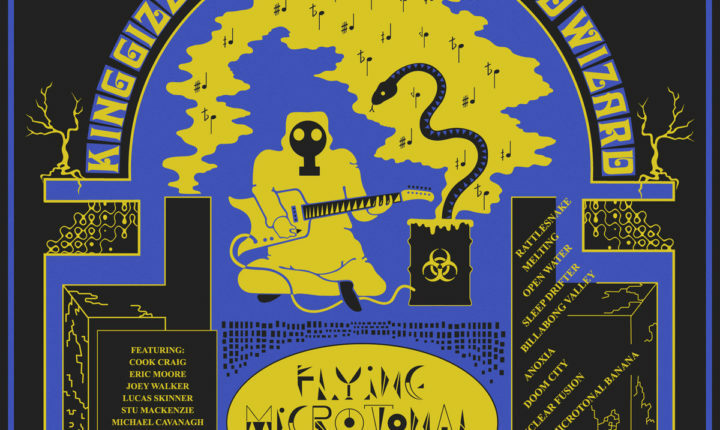 Flying Microtonal Banana is out now. Buy it here on Amazon.